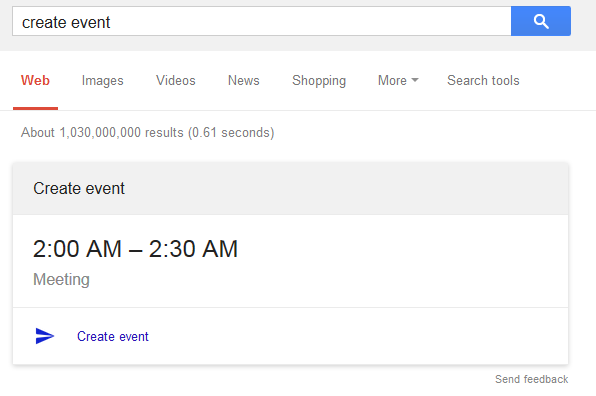 You can now create events from Google Search. Type create event, add event, new event, add meeting or schedule appointment and Google shows the details for a generic Meeting event that starts in a few minutes. You can add the event to your calendar or click the time to go to Google Calendar. 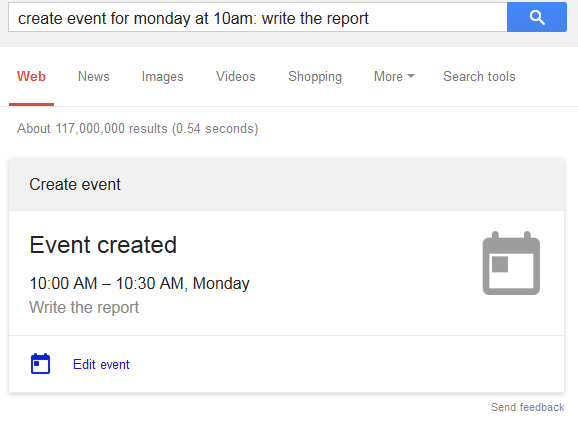 A better idea is to enter something more specific: create event for Monday at 10am: write the report. 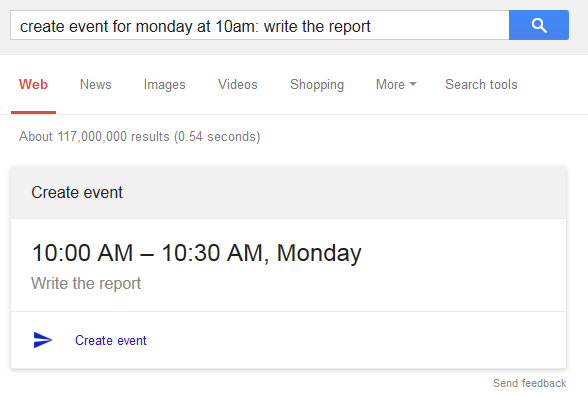 This way, you can create the event directly from Google Search and you don't even have to open Google Calendar. It's similar to the "quick add" feature from Google Calendar, except that you need to add some text like "new event" or "create event" and detection doesn't work that well. You can click "edit event" to open Google Calendar and make some changes. This also works when you use voice input. cool! but, how can you create a meeting on someone ELSE'S calendar, with an INVITE list? thx! I had a search through the link, but believe it or not I am really unsure of what would work for us. Canada April 2018 – Calendar with holidays. https://june2018calendar.tumblr.com/post/170031894379/april-calendar-printable-template-usa-2018 Monthly calendar for the month April in year 2018. Calendars – online and print friendly – for any year and month. Our bright and colorful easter greetings are perfect to put the happy in your easter! happy easter sunday cards Send an Easter Ecard from American Greetings to show them you care!